Victoria Claflin, the sixth of ten children, was born in Homer, Ohio on 23rd September, 1838. When Victoria was a child the family was forced to leave Homer after her father, Reuben Claflin, was accused of an insurance fraud. She received very little education and spent most of her childhood with her family's travelling medicine show. At the age of fifteen Victoria married Canning Woodhull. The following year she gave birth to Byron Woodhull. Over the next few years she earned a living by telling fortunes, selling patent medicines and performing a spiritualist act with her sister, Tennessee Claflin. Canning Woodhull was an alcoholic and in 1864 she divorced him and two years later married Colonel James Blood. In 1868 Victoria Woodhull moved to New York City where she became friends with millionaire railroad magnate, Cornelius Vanderbilt. With Vanderbilt's backing, the enterprising sisters went into business as Wall Street's first female stockbrokers. The sisters made a large amount of money and this enabled them to publish their own journal, Woodhull and Claflin's Weekly. Woodhull's journal was used to promote women's suffrage and other radical causes such as the 8 hour work day, graduated income tax, and profit sharing. Woodhull also exposed fraudulent activities that were then rampant in the stock market. Woodhull became the leader of the International Working Men's Association (the First International) in New York City and in 1872 controversially became the first person to publish The Communist Manifesto by Karl Marx and Frederick Engels. In May 1872 Victoria Woodhull was nominated as the presidential candidate of the Equal Rights Party. Although laws prohibited women from voting, there was nothing stopping women from running for office. Woodhull suggested that Frederick Douglass should become her running partner but he declined the offer. Friends of President Ulysses Grant decided to attack Victoria Woodhull's character and she was accused of having affairs with married men. It was also alleged that Victoria's previous husband was an alcoholic and her her sister, Utica Claflin, took drugs. Woodhull became convinced that Henry Ward Beecher was behind these stories and decided to fight back. She now published a story in the Woodhull and Claflin's Weekly that Beecher was having an affair with a married woman. Woodhull was arrested and charged under the Comstock Act for sending obscene literature through the mail and was in prison on election day. (Woodhull's name did not appear on the ballot because she was one year short of the Constitutionally mandated age of thirty-five.) Over the next seven months Woodhull was arrested eight times and had to endure several trials for obscenity and libel. She was eventually acquitted of all charges but the legal bills forced her into bankruptcy. In 1878 Woodhull moved to England. She continued to campaign for women's rights and in 1895 she established the Humanitarian newspaper. 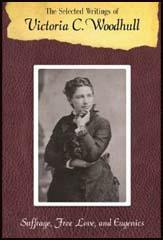 Victoria Woodhull died on 9th June, 1927. Everybody prates of the wonders of the present age of the world, and yet it may be doubted whether any of us half estimate its really marvelous character. Every age, objects some captious reader, or some discontented pessimist, is a a great age to those that live in it, just as everybodys own country is the greatest of all countries, or as every mothers baby is the finest baby that ever was born. We must still regard this latter half of the nineteenth century as the most distinguished speck in the worlds history. There is, we believe, a hundred times more mental activity at this time in the world at large than at any previous period, and events are progressing in a proportionately rapid ratio. It is an error to suppose that evolution in anything always takes place at the same even rate. A few grand hindrances, accumulated obstructions, and formidable obstacles have hitherto hedged the tendency to this easy-going tendency to the easy and rapid progression of the race. Despotism, slavery and oppressive restrictions on women are or have been the chief barriers. Despotism still lingers on the stage in Europe, but shudders with instinct of its own early destruction or decay. Slavery has just met with its quietus. Hindrances to the freedom of woman are rapidly yielding, and will dissolve into nothing sooner than either of the other obstructions referred to, as there are a thousand causes favoring that revolution which have not favored the others, and as the accelerated movements of reform itself is now brought to bear on this new subject of thought, discussion and action. People who do not stand upon principles and guide all their actions by them are always found contradicting and stultifying themselves. People who tell lies must resort to habitual lying in order to be consistent and not expose themselves; but such persons are, sooner or later, certain to be detected, since it is natural for people to speak the truth rather than to lie; and sometimes they will forget themselves and act in accordance with their natural inclination. We are forcibly reminded of this general rule of life from comparing the present attitude of some of the "Boston Exclusives" with that assumed by them in past time. Last week was presented the protest against marriage laws made by Lucy Stone, who is most vehement against us for now advocating their amendment; This week we contrast the position of the editor-in-chief of the organ of the Exclusives with that she occupied in 1869. On the 15th of July, at a Woman Suffrage Convention at Plano, Ill., Mrs. Livermore, then a resident of Chicago, made the following speech upon the proposition that "the men and women most forward in this movement are of immoral character," are such as we do not most desire to pin our teeth to: "Mrs. Livermore," says the Aurora Herald, "denied the above in toto. She was herself President of the Woman Suffrage Association in the west, and Mrs. Jane Willing, of Rockford, was the Secretary. The well-known advocates of the cause were of the purest morality. No purer girl lives than Anna Dickinson? No more tender mother than Mrs. Cady Stanton; no truer woman Susan B. Anthony; and hosts of the great and good men throughout the land." "But what difference does it make to the hungry man whether his food comes to him on a dish of gold or silver, or of wood? In either case it satisfies hunger as well. What difference does it make who buys it? And so with the truth - whether presented by an angel or a devil, the truth is all the same; and blind is the man who cannot see that. Is Woman Suffrage right? That is the question. What matters it who advocates it, whether Free Lovers, Spiritualists, or the Methodists, orthodox or heterodox? It makes no difference. Truth is truth wherever we find it." The Herald afterward says: "To Mrs. Livermore was tendered the thanks of the Convention for her instructive speeches, accompanied by a roll of greenbacks." Mrs. Livermore at that time belonged to the class who were the objects of abuse, who were called all sorts of bad names by the then "respectables." But a change has come over the spirit of her life. She has contracted the disease of respectability and can abuse as vilely as the most pious of former times. Then Mrs. Stanton and Miss Anthony were good women and true. Now they are not fit for the excellent Bostonians to mingle with at all; indeed, they will have nothing to do with anything that either these ladies associate with. They are even doing the cause "great injury," according to the paper Mrs. Livermore edits, because they hold more advanced social ideas than are considered admissible by the clique of which she is chief. But Mrs. Livermore considered the truth of suffrage to be acceptable even from Free Lovers and Spiritualists then, while now they are not even to be permitted to so much as approach the platform upon which "the immaculates" stand. They are even so discourteous as to tell them in a call for a convention that they are not wanted. We presume Mrs. Livermore and the rest of her set are not as hungry for suffrage now as she was then, since they will not accept it through anything that has a taint of Wood about it. Suffrage must be tendered to them on golden plates; and be most graciously offered by satin-clothed servants; their tastes have so improved upon what they were that anything short of this will not agree with their present delicate sensibilities. . . .
For our part we should be very glad to have the movement for suffrage receive the support of all persons who are honest advocates of it; but we maintain now, as Mrs. Livermore did in 1869, that whoever rejects aid, let it come from whatever source it may, is not for suffrage but against it; and Mrs. Livermore and all the rest of that clique know it is so. And when they say that the 150,000 readers of a paper which advocates suffrage earnestly and persistently, are not representatives of the movement, and, in fact do not belong to it at all, simply because they patronize that paper which advocates Lucy Stones former marriage theory in preference to the Journal, they know they speak a lie of which they are liable to convict themselves, whenever the spirit of truth predominates over their assumed policy of falsehood. It will therefore be our duty to call on women everywhere to come boldly forward and exercise the right they are thus guaranteed. It is not to be expected that men who assume that they alone, as citizens of the United States, are entitled to all the immunities and privileges guaranteed by the Constitution, will consent that women may exercise the right of suffrage until they are compelled. We will never cease the struggle until they are recognized, and we see women established in their true position of equality with the rest of the citizens of the United States. Hence, we may safely assure everybody that every word which appears either in platform or resolutions which that convention formed, was intended in dead earnest. Some brainless editors who have never grasped an idea or had the capacity to entertain a principle, but who, from a continuous practice of lines of policy, bring all their natural capacities to do either, may talk of its being childs play and nonsense; but they will live long enough, if they live only till next November to learn that their wisdom is indeed foolishness. Many imagine because, in reality, they have never stopped to think about it, that our systems of law, organism and execution, are consistent with the theory laid down in the Declaration of Independence. There could be no greater error than this supposition. There is not even the faintest shadow of truth in it, unless, perhaps, it may be said that the first section of the Fourteenth Amendment may be an exception; and whatever of salvation there was in that, they attempted to defeat, by the next section, fearing to let a single grain of real freedom and equality stand free from the tares of despotism.